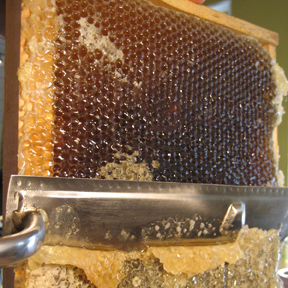 One of the most thrilling aspects of bee keeping is having that first taste of each season’s honey. I’ve certainly been known to sneak some honey periodically throughout the summer, but generally I wait until the end of August to pull the honey supers off – which means I get a mix of everything the bees have foraged on all spring and summer. It always such a surprise to see what the girls have brought in each year. I’ll never forget my very first honey crop and its delicate apple flavor. At the time, my bees were located in the heart of Bayfield’s “orchard district,” which meant no shortage of fruit blossoms to forage on. And then there was the harvest that had a decidedly minty undertone. That was the year when the basswood trees went crazy with blooms all summer long. I’ve pulled off late fall supers that are filled with the heady dark brown nectar from goldenrod and asters. And I’ve taken plenty of swipes of that gorgeous, light, early summer clover honey while working in the hives. But my main fall honey harvest is like a little mystery I get to try and crack each year. The color and taste of each super full of honey is my main clue to where the girls have been spending their summer afternoons. So I couldn’t decide if I was more amused or distraught when I read an article in last Monday’s NY Times about several hives of New York bees who evidently spent their summer feeding on the sweet run off from a nearby maraschino cherry factory. The results were neon red frames of honey. The sort of gaudy red that only red dye number 40 can produce. Albeit shocking, it is a great example of how amazingly distinct honey can be, and how each honey is a direct link to what the bees are feeding on. Foraging bees will travel up to 3 miles for food. And when they find something they like, word gets around quickly. Lets face it – taste buds talk, and bees are no exception. Bees not only have taste receptors on their tongues, but on their feet and legs as well (how cool is that?!). So who’s to fault them for choosing some manmade, red inflicted corn syrup over a fresh, dewy clover blossom? I’m no one to talk – I still have a soft spot for those cloyingly sweet cherries. They saw my brother and me through many a shirley-temple based cocktail hours as kids. But unlike humans, bees shouldn’t have to know better. As a beekeeper, I feel a responsibility to keep my hives as healthy as I can. Yet I don’t think I could begrudge my girls their bliss should they happen to stumble upon some “junk” food. How lovely to go through life feasting on the best tasting things you can find in a 3-mile radius. I envy such simplicity. I’ve realized that my enjoyment of your blog is the same feeling I got with each issue of Gourmet magazine. I was heartbroken when they discontinued it. I struggled to find anything that gave me the same feelings when I read the words used to describe life and food together. (I still go back to read the old issues). Thank you for sharing your talents with me. I savor each entry! The words and photos are always wonderful. And it is the “cherry on top” since I know you and your beautiful space in the woods. Thank you, Jill! Thanks Dani – you flatter me so! I adore this blog…it pops up in my mail and I get excited to see what is going to be the next great story! Thanks for sharing! I love your blog. It’s so me (lol)! I love, love, love GARLIC. I ‘collect’ honey from wherever I’m travelling so at any given time I many different varieties. I also love children’s literature so your quote from Charlotte’s Web was the first thing I saw and it made me smile. Looking foward to reading more. 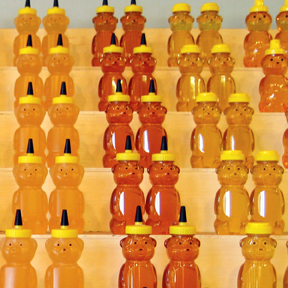 I read your post yesterday and woke up to find this piece in Grist: part II to the red honey! Thank you, Jill for sharing such great stuff! Great story Nancy – thanks for the link! And I’m heartened to know that the factory owner is willing to work with the bee keepers. As of the writing of the Times pieces – he was “unavailable for comment.” And that he has as sense of humor – with the rainbow hued honey idea.